BAF’s current President and VP – who are both amazing, strong, kickass women – talk about BAF, how it was founded, why it exists, how it continues to fund abortions in the state of Maryland, and why they care so deeply about reproductive rights. Listen to this episode and then immediately donate to BAF (I’d be shocked if you weren’t compelled to after hearing Spencer and Annie's passion in this interview). 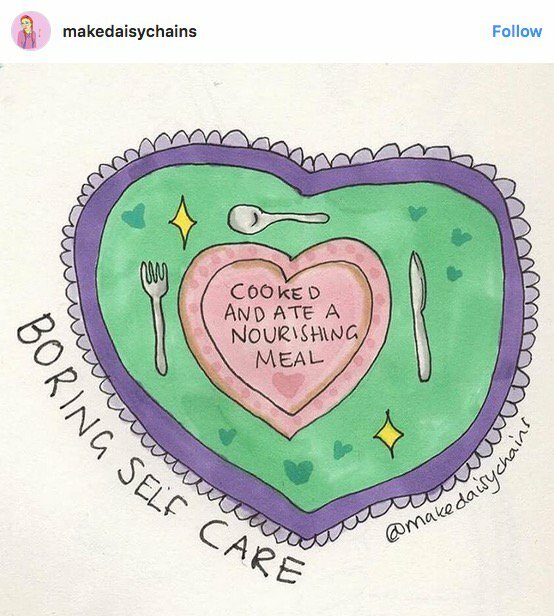 Maybe you’ve seen the #boringselfcare hashtag circulating; Hannah is the talented person behind the original art. Go follow her IG page (@makedaisychains), because she has beautiful and powerful sketches about mental health. Self-care is so very important, especially in the world in which we currently live. Take a nap. Take a shower. Get a good crying session in. Take care of yourself. This is an unbiased, empirically-based podcast episode about abortion. This 45-minute episode does a great job explaining how different abortion procedures work, teaching reproductive terminologies, and dispelling myths about abortion. This would be a great resource to send to friends and family who use pseudo-science to protest abortion. A look toward next month: NNAF's Annual Summit! I am so thrilled to be attending NNAF's Annual Summit this month and I will be happy to share my thoughts and feelings (so many feelings) with all of you beautiful readers in my next installment. Enjoy your month & see you again in July!